South of Mountain Home, Idaho, is where the tallest (470') single-structured sand dune in North America rises. This sand dune is a bit different in that it rises in the center of a natural basin while most dunes form at the edges of natural basins. These dunes also don't move much and are pretty much in the same place in which the collection of sand started with the Lake Bonneville Flood some 15,000 years ago. Bruneau Dunes State Park is 4,800 acres centered around that sand dune, but that dune isn't the only wonder of nature within the park. 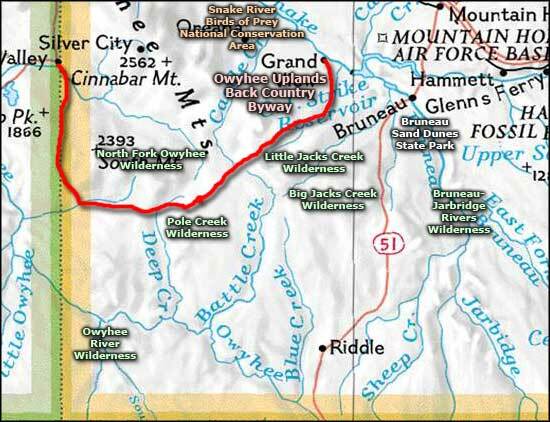 The park also includes lake, marsh, prairie, desert, and dune habitat with opportunities for birdwatching, fishing, hiking, camping, swimming, and looking at the stars at one of the two public observatories in Idaho. Climbing on the dunes is fine but no vehicles are allowed. There is a marked 5-mile hiking trail that leads out into the dunes if you are so inclined. The visitor center offers information and displays about the wildlife, insects, fossils, birds of prey, and the sand dunes themselves. The only hunting allowed is by cameras and binoculars. Bruneau Dunes State Park offers a campground with 16 standard sites and another 82 sites with water and electric, most with shade trees or shelters nearby. The Observatory at Bruneau Dunes is open from the end of March until late October on Friday and Saturday evenings. 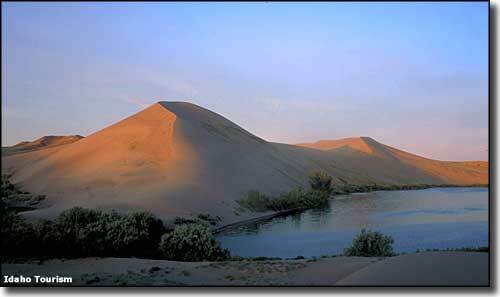 Bruneau Dunes State Park is part of the Snake River Birds of Prey National Conservation Area. Excellent bass and bluegill fishing is available in the small lakes at the foot of the dunes. These lakes allow non-motorized boats, canoes, float tubes and rubber rafts only. 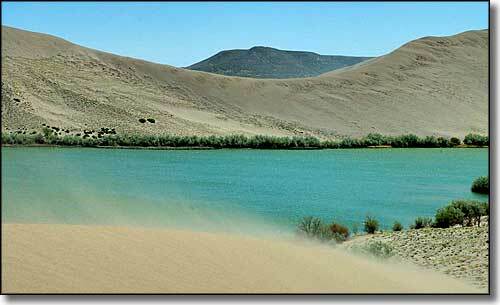 Upper photo of Bruneau Dunes State Park courtesy of the Idaho Department of Tourism. Lower photo of Bruneau Dunes State Park courtesy of Lazarus-long, CCA ShareAlike 3.0 License.